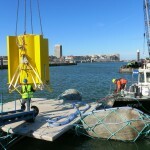 Flemish wave energy developer Laminaria has joined forces with the European Marine Energy Centre (EMEC), Innosea, Ghent University, and TTI Testing to support the development of their novel wave energy converter (WEC). 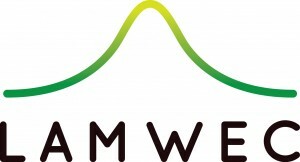 Funded under the OCEANERA-NET First Joint Call 2014, the LAMWEC project seeks to develop and test a 100kW Laminaria WEC, progressing from TRL stage 5 (technology validated in relevant environment) to 7 (system prototype demonstration in operational environment). The main focus of the project is to prove the survivability of the Laminaria WEC, which incorporates an innovative storm protection system, at pre-commercial scale in extreme storm conditions. 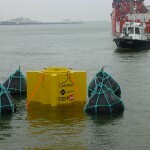 The LAMWEC consortium will address specific technology challenges – including the development of a mooring and pulley system to support the innovative storm protection system, power take-off (PTO), frame and new anchor design – enabling the partners to bring together and further develop their technical expertise, with over 30 years of combined practical experience in ocean energy. The project will culminate in the testing and performance assessment of Laminaria’s wave converter at EMEC’s grid-connected wave test site at Billia Croo, off the West Coast of Orkney in 2017. The LAMWEC project is being funded through OCEANERA-NET, an initiative looking to help address research and innovation challenges in ocean energy, coordinated by Scottish Enterprise.